The West Coast’s largest cities are reaching for the record books as a succession of towers vying for the mantle of the “tallest west of the Mississippi” go up across the region. Los Angeles’s 1,018-foot-tall U.S. Bank Tower, a prismatic 1989 blue and white skyscraper designed by Pei Cobb Freed and Partners, currently holds that title. However, developers in Los Angeles, San Francisco, and Seattle are seeking to depose the U.S. Bank Tower—all three cities currently have high-rises in the works set to surpass the record. These projects, ranging from in design review to nearing completion, are unified by their record-breaking potential and densely urban locales. Each is sited in transit-oriented districts poised for radical redevelopment. Merely inching above the current record, the towers speak to West Coast cities’ cautious approach to reshaping their skylines, as contemporary considerations regarding the nature of density, regulation, preservation, and affordability begin to play out over these post-recession metropolises. 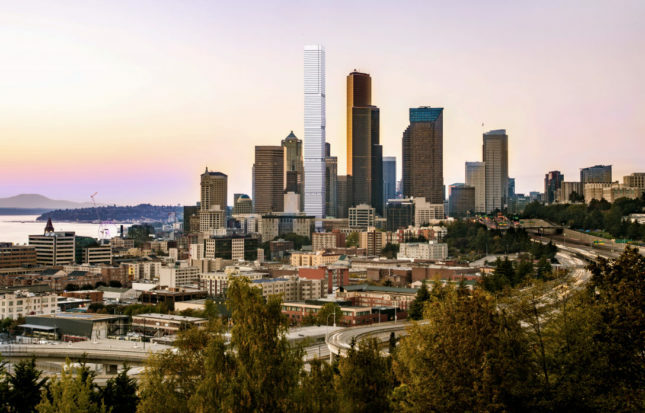 In Seattle, local firm LMN Architects has had to take its 1,111-foot-tall proposal for the 4/C Tower from Miami developer Crescent Heights back to the drawing board several times, trimming the tower’s height with each iteration. A boxy, mixed-use monolith containing groups of mixed income “vertical neighborhoods” with neighborhood-specific common areas above office space, parking, and commercial zones, 4/C is unique among the group in its inclusion of an affordable housing component. 4/C has had to straddle a delicate line in terms of massing and geometry—it’s located across the street from Chester L. Lindsey Architects’ 76-story Columbia Center, currently Seattle’s tallest at 967 feet, and nearby Minoru Yamasaki’s iconic Rainier Tower. It was 4/C’s height, however that came under scrutiny earlier this year when the Federal Aviation Administration (FAA) issued a report citing possible interference with medical helicopter flight paths and the navigable air space of the nearby King County International Airport. Although the FAA has mandated a 965-foot maximum height for the structure—a limit that would keep it just feet below the record—plans submitted early April, call for a 100-story, 1,029-foot tall structure containing up to 1,020 residential units and 100 hotel rooms above 20,000 square feet of street-level retail, 85,000 square feet of office, and 750 parking spaces. 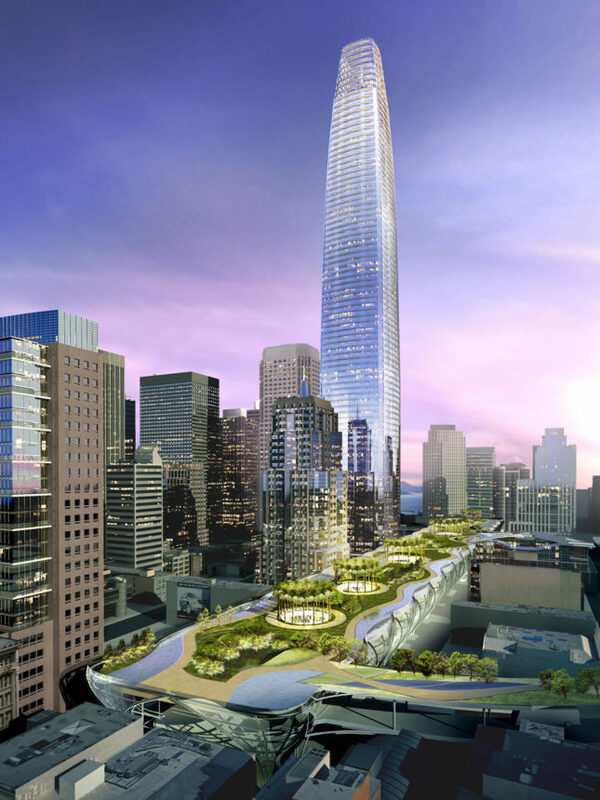 700 miles to the south, Pelli Clarke Pelli Architects’ (PCP) 1,070-foot-tall Salesforce Tower is slowly rising out of San Francisco’s Transbay Center. The currently under-construction $4.5 billion transit center, touted by the managing Transbay Joint Powers Authority (TJPA) as the “Grand Central Station of the West,” is topped by a PWP Landscape Architecture–designed 5.4-acre park. The six-track, multimodal hub will bring together the region’s tangled web of transit agencies and California’s future intercity high speed rail line. Its construction follows the demolition of the seismically deficient Embarcadero elevated highway that once ran along San Francisco’s waterfront. With the Embarcadero’s massive, swooping on- and off-ramps south of Market Street now gone, the city has been free to develop an area that was previously roughshod and derelict. 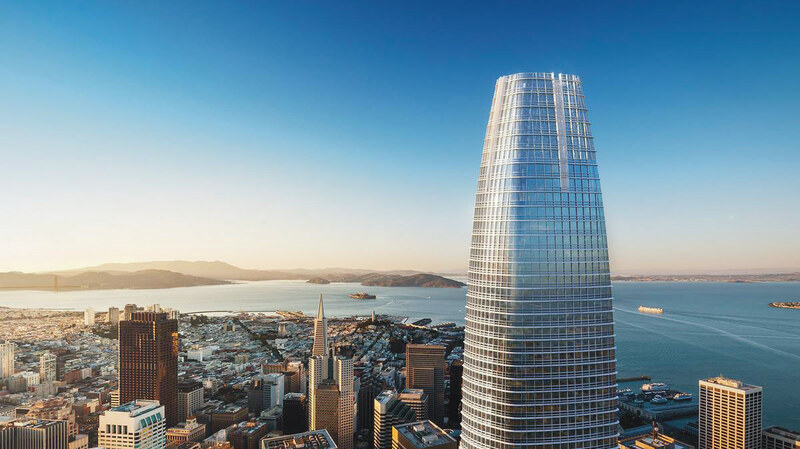 Salesforce Tower is touted as the crown jewel of this new high-rise neighborhood. PCP’s curved and tapering design, built in concert with the firm’s transit center, will contain 1.4 million square feet of Class-A office space and be topped by a 100-foot-tall “crown.” Billed to rise 1,070 feet upon completion in 2018, it will soar 217 feet above William Pereira’s 1972 Transamerica Pyramid, currently San Francisco’s tallest. Meanwhile, Los Angeles’s Wilshire Grand Tower, a 1,099-foot-tall spire, topped out in March and is nearing completion. Aside from Gensler’s L.A. Live Ritz-Carlton Hotel built in 2010, the Wilshire Grand is to be the only other tower above 40 floors built in Downtown L.A. since Arthur Erickson Architects completed their 750-foot-tall Two California Plaza in 1992. A partnership between Korean Air, Turner Construction, and architects AC Martin, the tower will boast 400,000 square feet of Class-A office space and a 900-suite hotel, as well as a 400,000-square-foot retail podium with ballrooms, meeting halls, and a 1,250-spot parking garage. 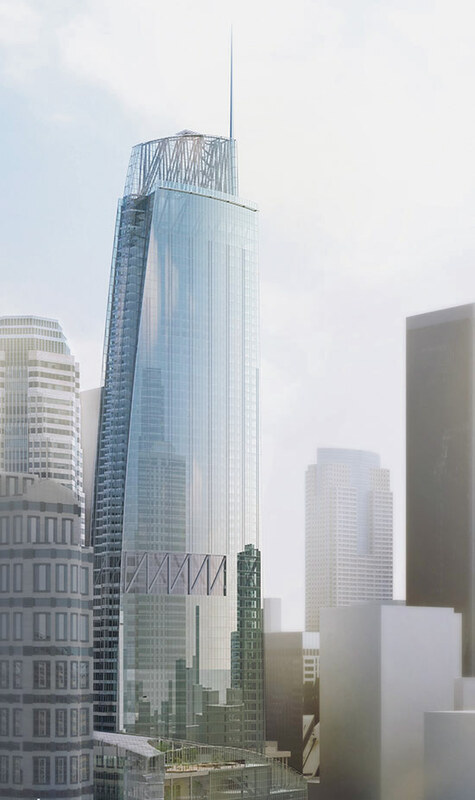 The 1,100-foot-tall Wilshire Grand is due to finish construction in late 2017, when it will become the tallest tower west of the Mississippi River. While the jury is still out as to whether Seattle’s 4/C Tower’s Crescent Heights will prevail, a trend is becoming clear: Developers are testing the waters and envisioning tall, mixed use, transit-oriented futures for the West’s downtowns.